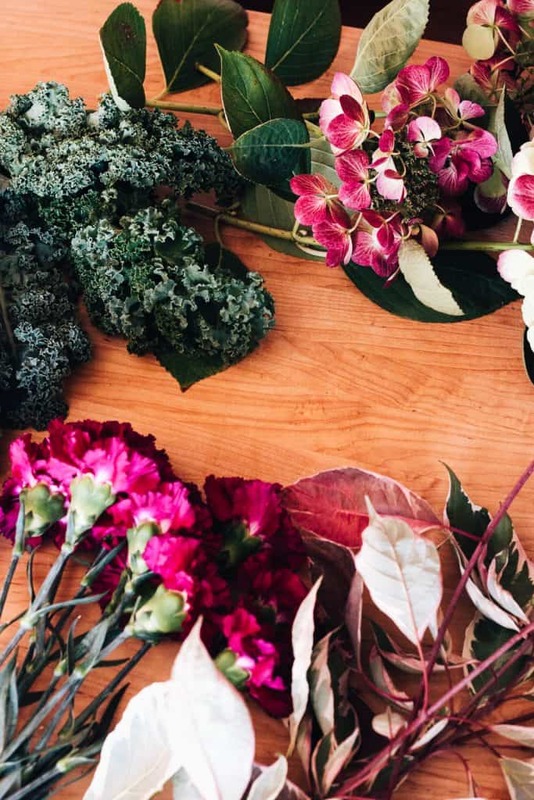 Learn to do your own diy flower arranging with this simple formula. Even with grocery store flowers! 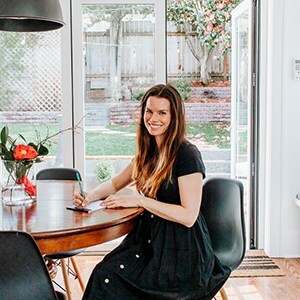 If you’ve ever wanted to diy your own flower arrangements, without spending a fortune in a florist shop, then I have a treat for you today. I recently took a flower arranging class and I’m spilling everything I learned with you here. I actually learned a lot at this class about arranging flowers, and not only that, but I discovered how much I love the art of flower arranging. 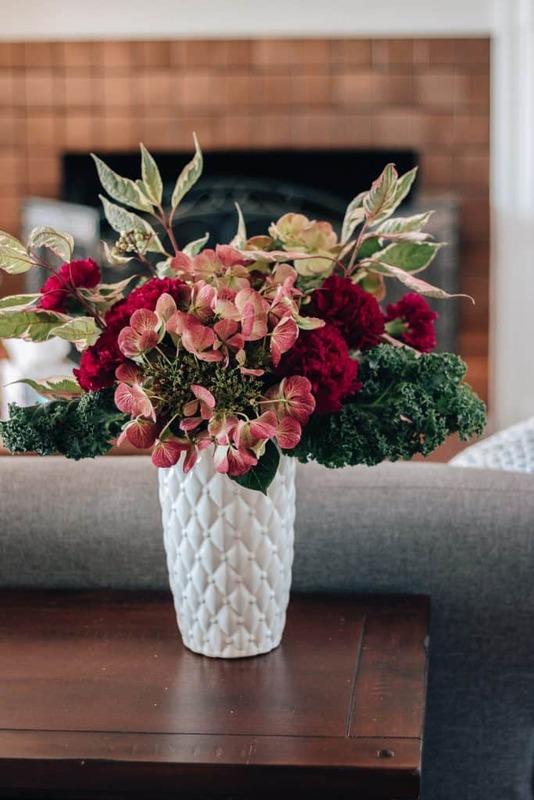 Of course, this is a fall flower arrangement because it’s fall outside, but you can apply these same rules to any season. Once I learned this formula – it was pretty easy to throw together my arrangement. First let’s consider two things : Color and Formula. When you are just starting out, the easiest way to make a floral arrangement look cohesive and well put together is to choose colors that are close to one another on the color wheel. Think – pinks and reds, blues and purples, yellows and greens. Some people think that you should choose the opposite color on the color wheel, but this can cause your arrangement to look a little disconnected. Unless you are a pro! When in doubt? Make an arrangement the same color. For instance, go all yellow, all pink, etc. This is a great way to make a cohesive looking arrangement. Choose different varieties of flowers in the same color scheme. 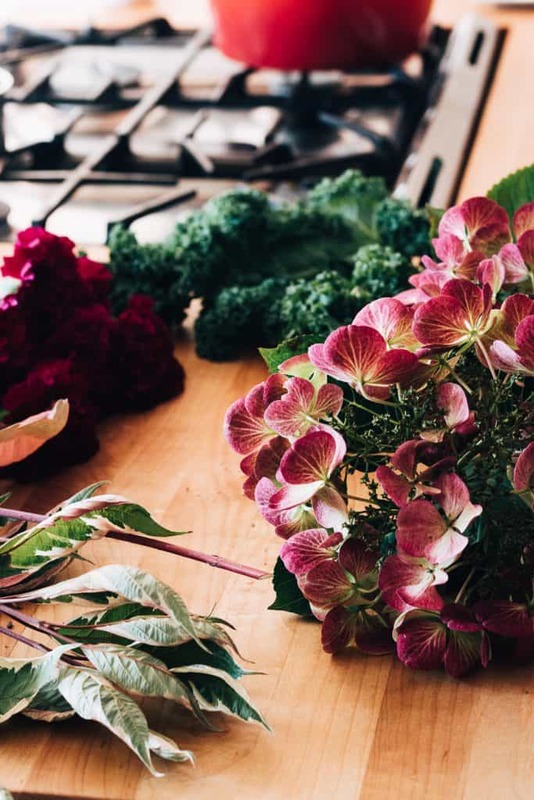 If you decide to go with one of those premade bouquets from the grocery store that mix different colors, you should start by pulling it apart. 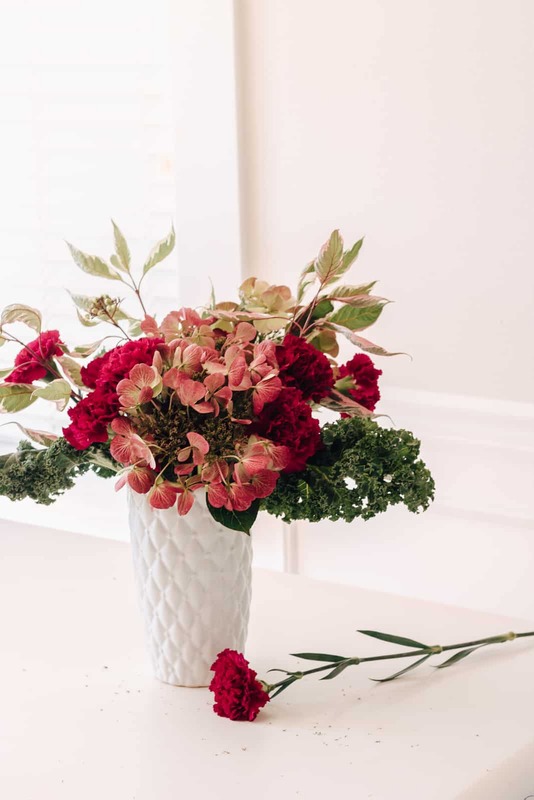 By pulling it apart and adding a few more things – you can take this blah arrangement and make it look like someone delivered you a professional bouquet! For the purposes of this tutorial – I went with a maroon color scheme. It feels very fall to me. Some of the items have more pink tones but still fall in that same pink/maroon family of colors. Now let’s look at the flower arranging formula that will helps us achieve a great look. Height/Something tall– You need something tall to help establish the height of the arrangement. Branches from trees, tall flowers or foliage, olive branches, long pieces of greenery all work well here. 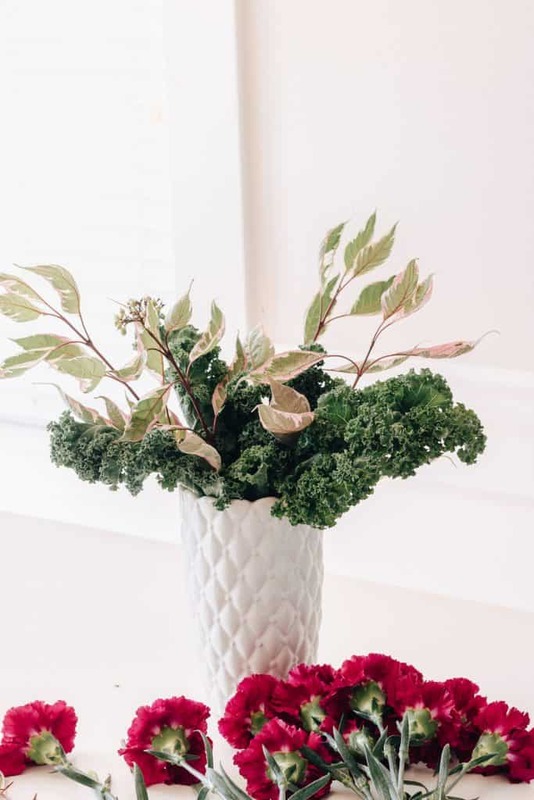 Filler/Something Lush – Flowers that have multiple stems, leaves or greens – anything that is round, lush and bountiful that will help shape and fill out the arrangement. Greens are great for this! 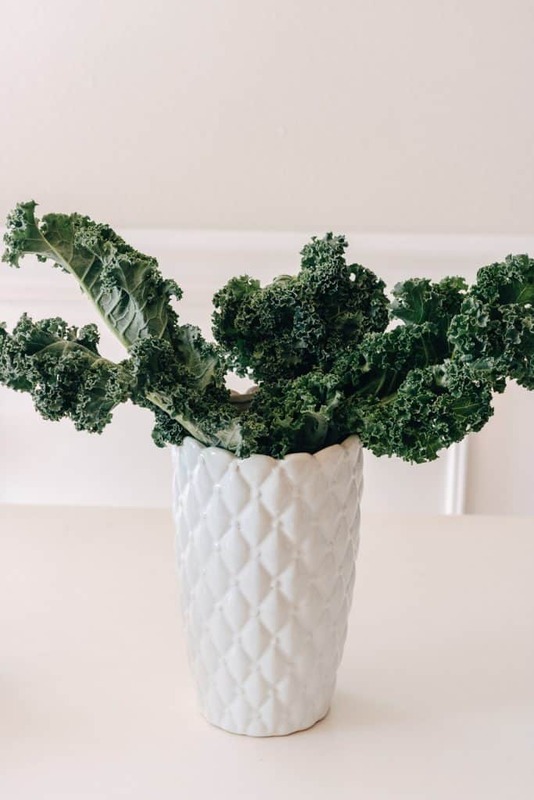 Think thicker varieties of greenery – like ferns, ivy, evergreens, even kale, swiss chard and herbs! Walk down the produce aisle of your grocery store to pick up beautiful fillers and other items for your arrangement (more on this later). Your own backyard is often the best for this – plus it’s free – can’t beat that! Center/Feature/Star – When you look at an arrangement – the center/feature element is the star of the show. This is the biggest flower in the grouping. These are usually placed in the center, perhaps slightly off the side a bit even. But mostly in the center of the arrangement. 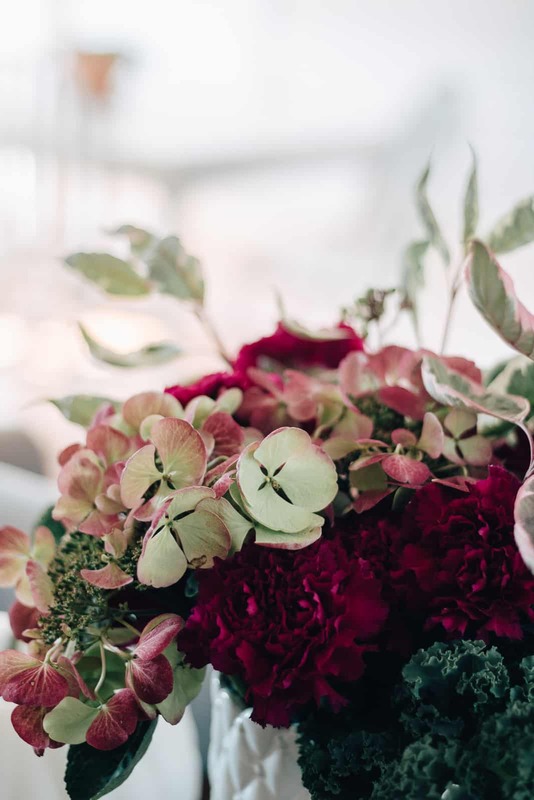 Think large flowers – dahlias, hydrangeas, large roses. Your feature element can also be beautiful fruits and vegetables, such as artichokes, peppers and pomegranates. Accent/Something Smaller – The accent items add some interesting color and texture to your arrangement. Choose something smaller than the feature flower and different from your filler items. 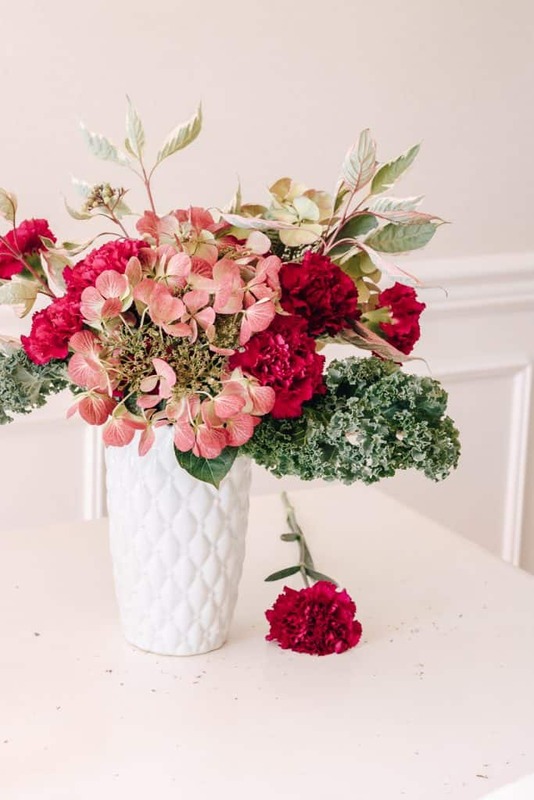 These accents simply add interest to your arrangement. Vessel – An interesting container makes an arrangement look so much better than just a basic, boring container. Perhaps you have something that was passed down to you in the family? Or maybe an interesting flea market find? Footed urns are beautiful, as are antique vases, and containers with color or interesting shapes. It’s also fun to think outside the box with vessels – terracotta pots can be really neat, pitchers, vintage jars and low bowls (more on this below). Height – I snipped some branches from a bush in our backyard. I’m sorry – I don’t know what they’re called. But they are long and the leaves are greenish and pink. The pink accented leaves is why I chose them. First you want to start off your clean container. Fill it with clean water and add some flower food. Group all your items into little piles – the height, the filler, the feature, the accent. The way I learned is that you want to establish the shape first – so start with your fillers. In this case, I’m use kale. You want them to spill out to the sides – if everything is just straight up and down it will look unnatural. We want to create whimsy and movement. We want the eye to move across the arrangement. I spread the kale out as I went along, so you don’t need to get this perfect on the first try. There is room to fluff and move things around as you go. Next – take your height items and stick them in where you want something taller. The Filler established the shape, the height will round it out up top and on the sides. I wanted my height branches to look natural, so I spread them out almost like a fan opening. If they droop a little – that’s ok! It adds interest. Follow the lead of your flowers/branches a bit. Take your accent flowers and fill in the bare and empty spots. It’s best to have the accent flowers vary in height. So perhaps one is taller and one is shorter – mix this look throughout. Again – we can tweak as we need at the end. Grab your feature flowers and stick them right in the center – or a little off center. It’s best to use odd numbers here. The mind and the eye likes odd numbers because it can find a middle. So keep that in mind. Now – you’re arrangement should be looking good at this point. Take more accent flowers to help fill out more of the arrangement. Or – rearrange your fillers to create more of the shape you want. The final floral design should be organic and natural looking. I mentioned earlier that a lot of elements for a great floral design can be found right in the ol’ produce section of your grocery store. I wanted to elaborate a bit more on that. Most fruits and veggies are fair game as accents or a feature in your arrangements. Walk down your produce aisle and see what sparks your interest. Fruits : Grapes, Pears, Lemons, Oranges, Pomegranates, strawberry branches, figs and apples. Vegetables : Kale (Green and Purple), Swiss Chard, Lettuces, Carrots, Peppers (especially pretty purple ones!) and mini pumpkins. Use Nature as a base too : Floral arrangements can be housed in hollowed out pumpkins and cabbages. If using a clear glass vase : Line the outside with sliced limes, grapefruit and lemons for an interesting touch. 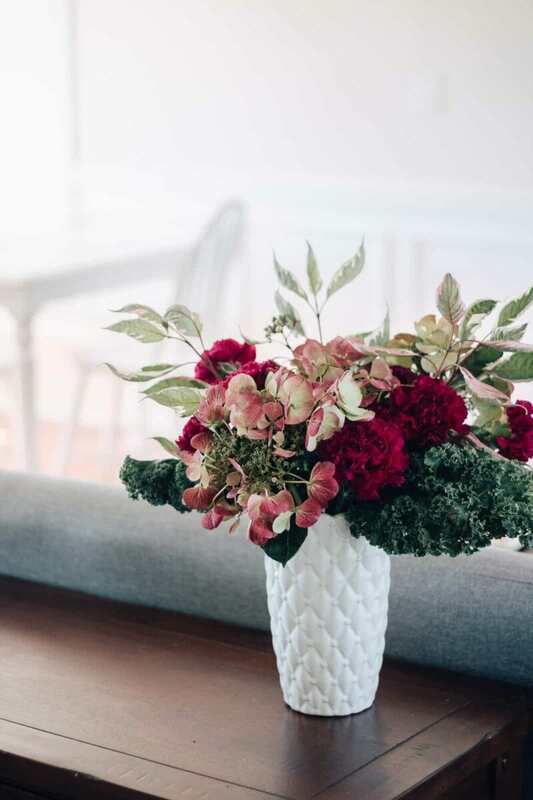 Use the Vase within a Vase trick : Place a smaller, skinnier vase inside your larger one. Line the fruit slices in between the two vases to hold them in place. To get your fruit and veggies to stay up in your arrangement – poke them onto a BBQ skewer and stick the skewer in your arrangement like you would any other stem. 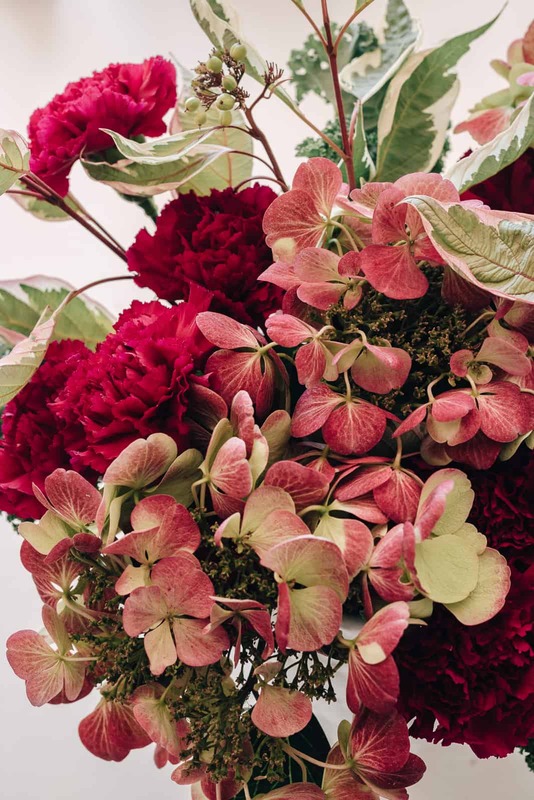 Look at popular floral designers for inspiration. Some of my favorites? Farmgirl Flowers, Floret Flowers and Tulipina. I also wanted to mention that hardcover floral books not only can help teach and inspire you about floral design, but they make amazing coffee table, entryway and bookshelf home decor. Guys — these are stunning books. Keep a stack of them together so you and guests can peruse at your leisure. 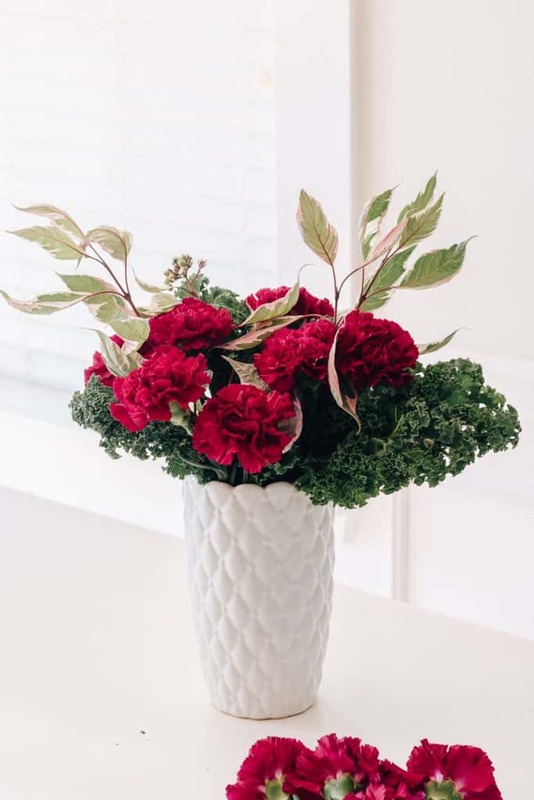 Some of the flower arranging hardcover books I recommend you check out are : Martha’s Flowers, Floret Flower’s Cut Flower Garden, The Flower Workshop and Color me Floral. PS : If you know of anyone who’s passionate about flowers and floral design – these books make amazing gifts. I really love how this turned out. And this diy floral arranging costs me a total of $9! The Hydrangeas and Greens were from my own backyard. I already had the container. The carnations were $7 a bunch at my grocery store and the kale bunch was $1.99. You can get a lot of bang for your buck this way. I’m definitely going to try more floral arranging designs for each season and be gifting these away more often. I do think this is the type of thing that you improve at as you work on them. Hopefully our floral design skills will continue to be refined!